My Lexmark C540n printer is printing faint yellow edges on the paper. I've googled this and it said the 'yellow developer' might be going? Can you buy these? What are they? I can't see on your website any black ink for my Lexmark all in one X543 printer. Can you tell me which others are compatible please? Should free postage for recycling apply to the Isle of Man? Last time we returned a cartridge in the box provided we had to pay about Â£4 at the Post Office as the label provided was not valid in the Isle of Man. They should be able to help you further. Would you like to save some cash for Lexmark toner cartridges? If your Lexmark printer is running low on laser toner then you can make significant savings by purchasing your replacement Lexmark C540n toner cartridges online store. With our competitive rates and our low price promise you can be totally sure of enjoying the cheapest offer on Lexmark C540n toner cartridges. Furthermore, Cartridge Save will only provide you with Lexmark C540n toner cartridges that are high in engineering quality and also cheap and so why be happy with anything less? If you've bought Lexmark toners from Cartridge Save previously you'll understand that our reliable delivery will reduce your costs. Spend significantly less when you purchase cheap Lexmark C540n toners by using Cartridge Save's shop. Cartridge Save a welcoming team of advisors to help make sure that ordering Lexmark C540n toner is a swift as well as uncomplicated process. Remember that Lexmark C540n toners supplied by us will also be guarded buy our no quibbles cash back guarantee that allows you the chance to be given a refund if you're unhappy because your toner doesn't work. We offer next day delivery, reliable cartridges along with the lowest prices so it makes perfect sense to shop with Cartridge Save for C540n toner supplies. The Lexmark C540N Colour Laser Printer is a useful colour printer for a small business or for a large company that requires quick printing. This single-function printer is able to handle multiple jobs using a 417 MHz processor that has 640 MB of RAM. This is a fast printer that is capable of producing up to 21 pages per minute and can also be used as a print server. The Lexmark C540N printer uses 4800 Colour Quality software as its primary image enhancer to produce crisp printouts. It is able to get its first print out in about 12 seconds and has a monthly duty cycle of 35,000 pages. This printer is also energy efficient and is able to operate at a sound level of 47 decibels. 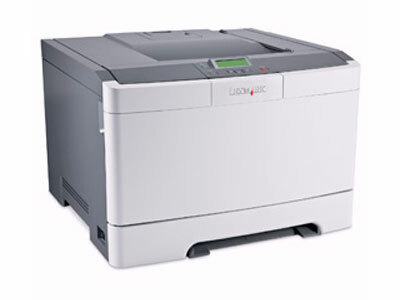 The Lexmark C540N is a two-toned simple printer that has a control panel that is placed right on top of the printer. It has a top exiting print tray and is loaded on the bottom through an easy-to-access media tray. This printer has a weight of 21 kilograms and has dimensions of 42.4 cm by 39.8 cm by 29.2 cm. It has a media capacity of 250 sheets and an output tray capacity of 100 sheets. This particular printer is also able to print on cards, labels, plain paper, and transparencies. Connection to your computer is easily accomplished using an high-speed USB cable and an expansion slot for additional memory is also included. One of the best features about the Lexmark C540N is its ability to print in a maximum resolution of 1,200 x 1,200 dpi. Another great feature is its Ethernet capabilities that allow this printer to be easily used by multiple computers in a Local Area Network. In addition, it is able to hold 250 sheets of paper without additional trays for reloading. One of the downsides to the Lexmark C540N is the inability to offer duplex printing. This printer is also known for its high use of Lexmark C540N toner, although cheap Lexmark C540N toner is available at Cartridge Save. If a certain colour of toner is out, you will not be able to print in other colours until you get that cartridge replaced, which can be very bothersome.